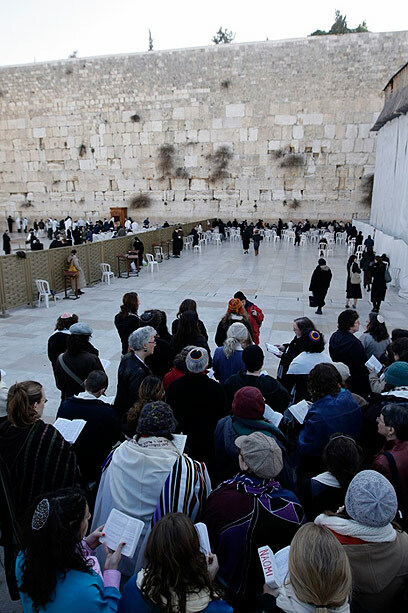 Over a hundred women arrived at the Western Wall Wednesday morning wrapped in prayer shawls and wearing kippahs, to mark 20 years since the inception of the Women of the Wall organization. Women of the Wall organizes female prayer groups at the Western Wall each month on Rosh Hodesh. The participants usually wear tallit, teffilin and kippah and chant from the Torah. The group, which included dozens of Reform movement members from North America, accompanied the Hallel prayer with singing, consequently provoking heated responses from other visitors and the Wall's ushers, who demanded that the group leave the place as its members "failed to follow the place's customs." Anat Hoffman, executive director of the Israeli Religious Action Center (IRAC), the public and legal advocacy arm of Reform Judaism in Israel, took part in the prayer. She said that the group met with hostility, although the women did not intend to create a provocation. The vast majority of the Women of the Wall are feminist Orthodox who come to the site once a month to say a prayer and sing quietly, she said. "Because this time there were about a hundred women there, it sounded louder." According to Hoffman, while the High Court of Justice has already allowed the women's organized prayers to be held at the Western Wall, the holy site's rules stipulate that worshippers' feelings must not be hurt, and also set a prison sentence to offenders. The Western Wall's rabbi, Shmuel Rabinovitch, "interprets the term 'hurting feelings' in a way that silences half of the Jewish people," she said. "The ushers want us to take off our prayer shawls and move our lips without making a sound." "We feel that there is a great deal of hypocrisy here: On the one hand, the Western Wall symbolizes the unity of the Jewish people, and on the other hand women, who comprise half of this nation, are being silenced, along with the traditions of the biggest Jewish community in the world (American Jewry)," Hoffman claimed. She added that "local customs" should not be defined by the most extreme ultra-Orthodox denomination in Israel. "The State has turned the Western Wall into an orthodox synagogue where regulations are being enforced by force." Meanwhile, Western Wall Rabbi Shmuel Rabinovitch told Ynet that the women usually hold their prayer nearby the Wall, and not at the Western Wall Plaza itself. "Unfortunately, they severely offended the holy place… and stirred violence and division," he said. "The High Court barred them from acting in a way that is not in line with local custom, and the local custom is that women don't wear a prayer shawl, put teffilin or read out from the Torah. "The Western Wall is open to every woman to pray in her own way, as long as she does not breach the local custom, which is Jewish Halacha. An attempt was made today to create a provocation, desecrate the site and hurt the feelings of men and women worshippers. "This is a severe and inappropriate act, and we will make sure not to let it happen again," he concluded. 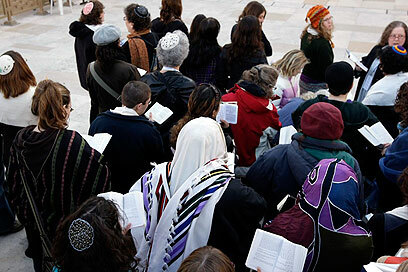 See all talkbacks "Women worshippers stir row at Western Wall "